The Consecration of the Rev. Gregory O. 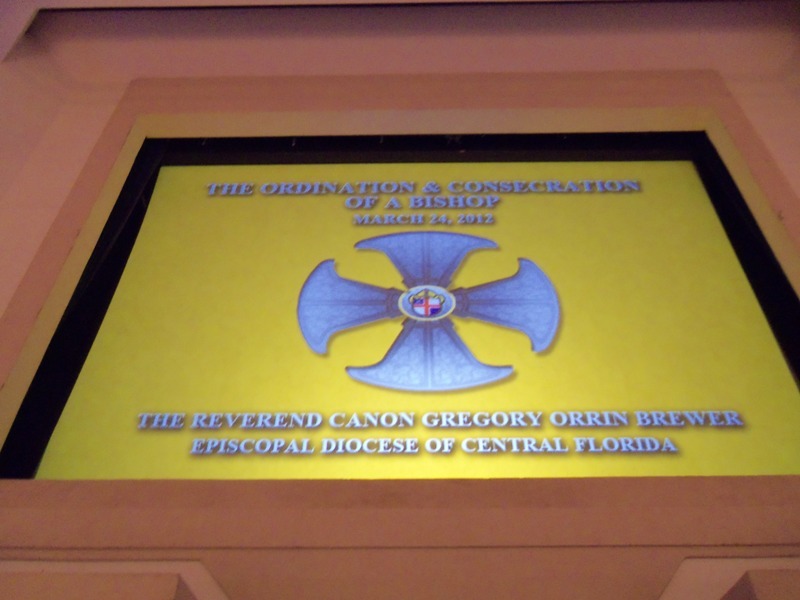 Brewer as Fourth Bishop of Central Florida | Lift Up Your Hearts! Our much-beloved Bishop of Central Florida, John Howe, retired this year. The bishop-elect was Gregory O. Brewer, and Saturday was his service of consecration. Choir members from all over the diocese were invited to participate in a massed choir for the event. We almost missed it. We had an event on Friday that took up half the afternoon and most of the evening, and a concert Saturday night. The Consecration would take up most of the (all too short) waking hours in between. Neither of us felt we had that kind of time and energy to spare. But God has his ways of nudging the recalcitrant, and we gave in. After all, had he not just brought us to this church, and hence this opportunity?1 And when would we again have the opportunity to sing with such a large and excellent choir? Before the big day, our choir had but one, two-hour rehearsal. The music, much of it commissioned especially for the service, was difficult. But it was fun, and we anticipated being able to lean on a large group of well-trained, well-rehearsed singers. 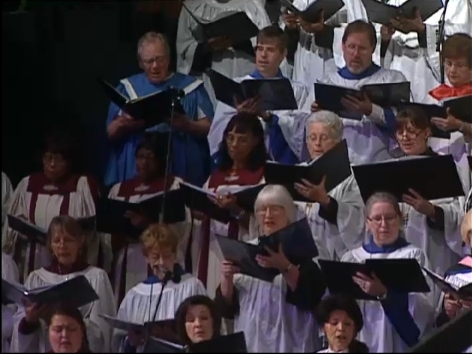 Our diocese has some large and fabulous choirs. Rehearsal was GREAT. The physical circumstances were a little difficult, as apparently the church was in the middle of some big production, for which an edifice had been built that divided the choir in two and completely covered the organ. The organist could see and hear the conductor through a television monitor, but the communication was one-way only. It led to some frustrating, and funny, moments. But all in all it was a wonderful experience. How I've missed the whole "musical scene" we were so much a part of when our kids were younger. I know musicians can be temperamental and hard to get along with at times, but they are a good example of how a community of those who have significant differences, and plenty of reasons not to get along with each other, can come together to accomplish great things. In fact, I think that's a pretty good model of how the church should be. Anyway, it felt great to be respected, and treated professionally, and to watch the real professionals at work. We'd both brought work to do during the "down times." Ha! We barely had time to swallow lunch, get robed, and say a few words to the friends who were there from all over the diocese. We were back in our seats and ready to go by 12:30, thinking we were being good and early, as the time advertised for the beginning of the service was 1:00. I do not know how that happened, but that time was everywhere, including the diocesan website and the live video stream. 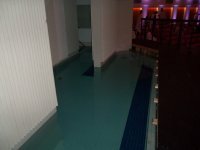 If we had come only for the service, we would have walked in at 12;50, maybe 12:55. And we would have missed a great deal, because things actually started at 12:30! I doubt anyone reading this has the time and patience to sit through the videos below, so I'll indicate some of the high points with approximate time markers. It was wonderful from start to finish, however, and quite moving to be part of it. If the choir looks scared at some points, well, it's because we were! Singing without adequate preparation requires concentration, and work! Once, in rehearsal, we were singing about being glad, and the conductor pleaded, "Now, could you just manage to look glad?" 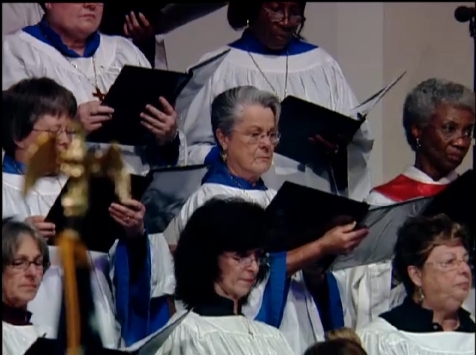 At one point in the Psalm, the camera even catches the soloist with that "Where are we?" look on her face. What the video misses by starting with the procession is the organ prelude, the choir's anthem O Taste and See (Vaughan Williams); the youth choir's anthem I Sing a Song of the saints of God, which had a lovely flute part, played by the person who was elementary school music teacher for at least three of my regular readers; two hymns (Blessed Assurance and Amazing Grace); Copland's Fanfare for the Common Man; and an instrumental piece (Veni, Sancte Spiritus) written specifically for the occasion by Andrew Walker, who directed the choir most of the time (and was fantastic to work with). Just to prove we were there :). Janet and Stephan watched the live video stream, from Switzerland, and caught these screen shots. View of the church from the structure that divides the choir area. Where you land if you back up too far while taking pictures. 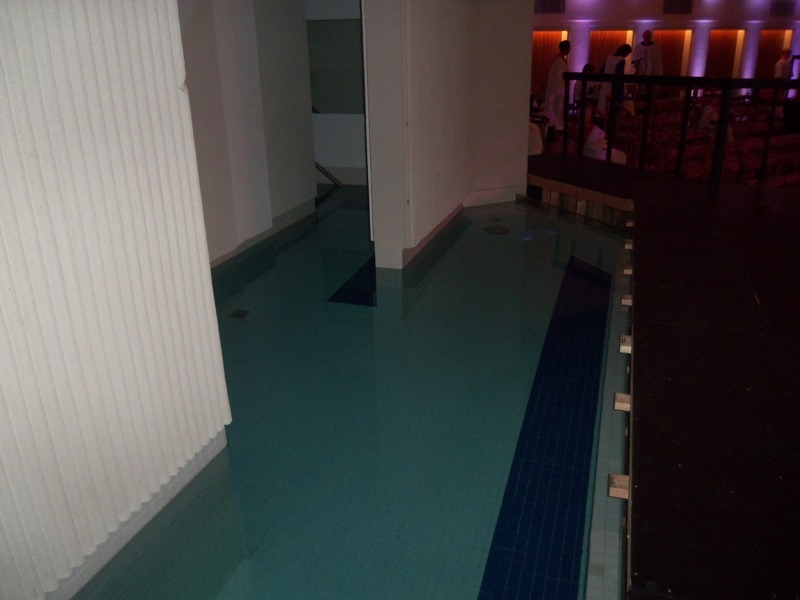 That's not a baptistry, that's a swimming pool! Here's the service bulletin (pdf). 0:00:00 Beginning of procession. Anthem: I Was Glad by C. H. Hubert Parry. We got our copy of this music the same time we got the robes. Do you wonder why the director had to remind us to look glad? 0:09:13 - 0:09:21 glimpse in the procession of friend TR. There may be better views of people I mention, but I haven't watched all of the video myself. You get what I've found. 0:40:55 Psalm: O Taste and See by Carl MaultsBy, who is also playing the piano. At first it was just hard, but the more we sang it, the more I loved it. You get a glimpse of Porter, and our choir director next to him, at 0:44:48, and of LM (friend we sang with in another choir) and DC (elementary school music teacher) at 0:45:20. 0:48:40 Anthem: Draw Us in the Spirit's Tether by H. Friedell. Beautiful song, and you get to see me, Porter, and the music teacher. 1:22:00 The Consecration, during which we sing Veni Sancte Spiritus (Taizê). It was wonderful to sing that again, bringing back memories of the best choir we've ever belonged to. I'll admit that when I saw them putting out the rug, I had the unworthy thought, "What? Because he's a bishop they give him a red carpet?" It wasn't until I saw the video that I realized he was lying prostrate on that carpet. It's a very moving segment. Part 2 of the service. 0:01:05 Anthem: Let the People Praise You by Benjamin Lane and Michael Miller. Probably the most difficult piece, but it's the one we worked on the most. It was quite impressive once we got it all together. In the middle, all the churches of the Diocese of Central Florida are named, praising God. The service did a wonderful job of expressing the diversity of the Diocese. Several different languages were spoken or sung, and many different styles of music contributed. The only disappointment was the Communion music (between Ubi Caritas and the recessional). It was contemporary Christian "praise music," and—difficult as this may be for those who know me to believe—I had been looking forward to joining in wholeheartedly. It's far from my favorite worship music, but in this context it would have been joyful to sing, especially since several of the pieces were at least somewhat familiar. But as it turned out, the choir was not expected to sing; that was left to the praise band. We were invited to sing if we wanted to, but I soon gave up because: (1) The speaker volume, which had been fine for the whole service, was for these songs cranked up to such a high level that I had to scramble for my earplugs, and if you've ever sung with earplugs in, you know that you hear your own voice much more than other singers, which is very uncomfortable when you don't know the song well and are trying to blend in. (2) Some choir members were singing, but most had not been provided music and didn't know the songs, which contributed even more to my feeling that my voice was standing out. (3) Our choir director had thoughtfully found music for the songs when he realized that we didn't have it, but it was pretty much useless because the band didn't follow the music. I don't think they even followed the bulletin; at least I know we didn't get to sing In Christ Alone, which I know well. 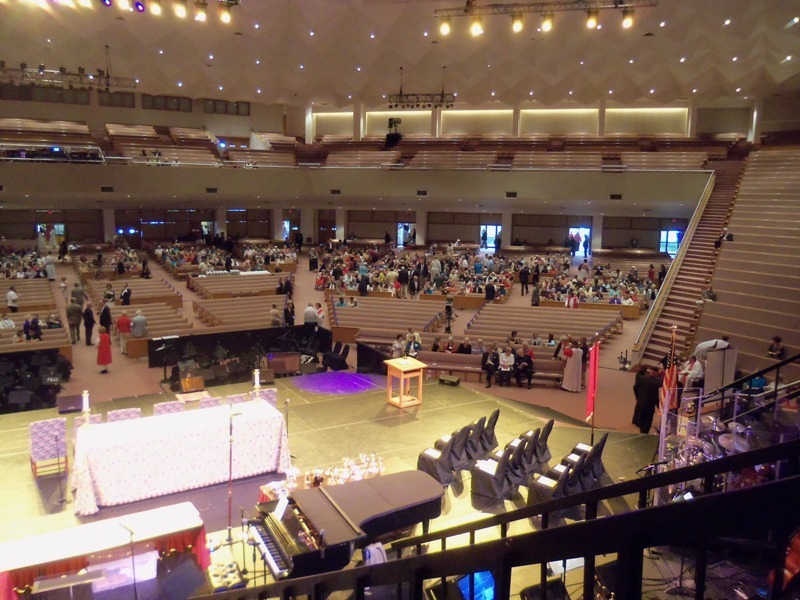 Anyway, even though it was a bit of a letdown from the choir seats, I heard that the Communion music went very well from the congregation's point of view. If you watch to the end of the service, you'll see the oddest thing: I think it's bad enough when people start talking and walking out before the postlude is finished, but in this case, they started tearing everything down in the middle of the final hymn, and were nearly done by the time the postlude even started. 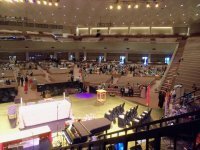 Apparently we were working under a very tight time constraint from the Baptists, who needed the church back for their own event. Any number of minor glitches aside, it was a glorious service and a wonderful experience. In many ways it was like a wedding: Those with positions of responsibility know all too well how many things went wrong, but to most people it is simply a beautiful event. I'm really glad we didn't miss this one. 1After fourteen years (minus a few brief interruptions) at the same church, which we still love and respect, we are now attending a church that is eight minutes away from home, rather than 45. We could walk to church! (But that would give us about the same long commute as driving to our old church, and we'd arrive too dripping with sweat to be able to don our choir robes.) Our new choir participated in the service, but our old one did not. 3I've been informed that these Disney designations are no more, deposed in favor of newer characters like "Hook" and "Mulon." The parking area way, way in back for the very late arrivals: "Sheol"! What am I missing? I can't find where your note 4 is. Even when I click on it it doesn't take me anywhere. Ugh, sorry. I see you've fixed it already. I made the above comment before trying a refresh . . . sorry. I'm leaving your comments in case others run into the same problem, which is quite likely. That's what I get for finishing a post late at night—I published without proofreading.